Get the family pet involved in the Halloween fun this year! 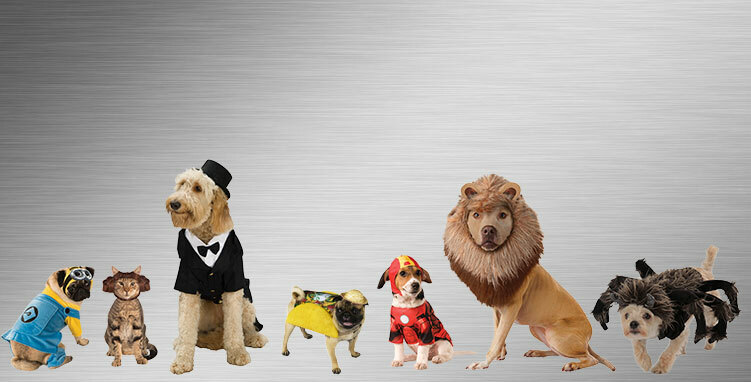 With this collection of Pet Costumes, you can turn your furry friend into a pirate pooch, a prisoner pet, an angel, a devil, and more, perfect for a night of trick-or-treating with the entire family and going out to costume parties. Every once in a while a new study comes out touting the health benefits of having a pet, to which the pet-owning population says, “Duh.” To pet owners everywhere, it comes as no surprise that having pets makes things better. Playing outside, simply sitting around the house, and vacations are so often made more fun by just having a pet to share your life with. They provide companionship, loyalty and, as the Internet has taught us over the last several years, hours and hours of stupid and hilarious entertainment. Videos of our pets have become such a part of our social media culture that even Internet cat videos have their own film festival now (we’re not kidding). So let’s celebrate these silly, furry family members and get them in on the fun! 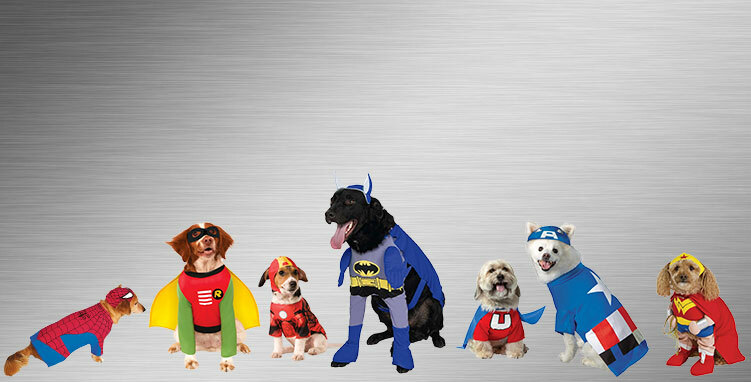 Our extensive collection of pet costumes will transform your four-legged friends into the pop-culture characters you’ve always known and loved. Perhaps your dog is not as ferocious or intimidating as he ought to be. Maybe he is as scared of the cat as he is of an intruder. If this is the case, we have the perfect solution. The Stegosaurus Dog costume is a fun and hilarious way to get little Buddy in the costume party spirit. When he dons this three-horned headpiece, folks will have to double take as this prehistoric pup waddles by. You know, July 23rd is a marvelous day. Summer is in full-swing and we can celebrate what is perhaps our most treasured national holiday: National Hot Dog Day. You might have your outfit all picked out for the big day, but what about old Max over there? Just because he’s a dog doesn’t mean he doesn’t like to get in on the fun! Fear not. The Hot Diggity Dog costume is the perfect get-up for your favorite dog in the world. We all know dogs are notoriously hard to shop for during the holidays. Do you get her another bone she’ll chew up in a heartbeat? One more chew-toy to get stuck under the couch after the first fifteen minutes? Well, we have your solution: The Santa Pet! This festive costume is the perfect way to turn Princess into a little furry Kris Kringle. It includes the red bodysuit and hat to give you all the holiday fun your family can handle. 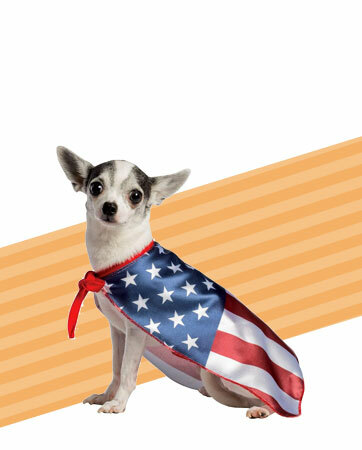 When in the course of human events it becomes necessary to celebrate a holiday by dressing up your pet in a costume, look no further than the USA Flag Cape pet costume. It’s simple, yet bold. It’s modern, yet timeless. It shows that the red, white and blue look good no matter where they are. For your patriotic pit bull or star-spangled spaniel, don’t just let freedom ring. Let it howl! If you’re looking to strike terror into the hearts of the other partygoers, this is not the costume for your dog. Due to an extremely high level of cuteness, the Wonder Woman Deluxe Dog costume is not recommended for actually fighting crime. On the other hand, it’s an excellent way to celebrate a costume party or get your pup in on some good old family fun. It features the jumpsuit and golden tiara for a superheroine canine. Today we’ll be discussing the cutest things in the galaxy. Please turn to chapter one titled, “Dogs Dressed as Ewoks.” The Star Wars Ewok dog costume is the perfect way to turn your favorite furry little at-home quadruped into one of your favorite furry big-screen bipeds. This one-piece costume comes ready for action so your dog can help you take down the Rebel Alliance or simply walk alongside you as you go trick-or-treating. We love our pets. We’d do anything for them and wear almost anything with them. And when it comes to costume parties, nothing is more fun than getting your pets involved. Your pet is an extension of your family and, as such, he deserves to be included in all family activities, including vacations, family photos (of course) and all family-sanctioned costume events. As you em-bark (get it?) on your costumed journey, don’t forget to include your pet. Not only is it the right thing to do, it’s also incredibly fun! Sure, you might look like a crazy person. And sure, you might have the unique opportunity to scoop the poop of your favorite Star Wars character. But we can assure you that it will be worth every embarrassing moment and adorable photo. Take a look and see which pair fits you and your pup. Are you among the many people who wish there were a way to celebrate one of the most heralded children’s books in American history for a costume party and include your pet all at the same time? Well you, my friend, are in luck. 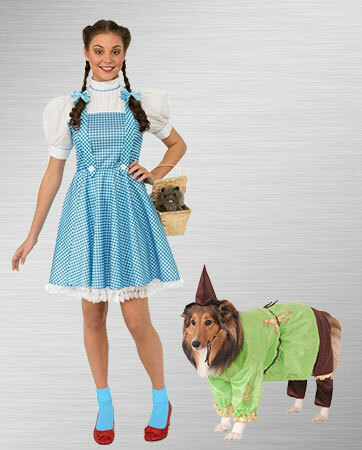 Take a joyful stroll down the Yellow Brick Road with the Wizard of Oz Scarecrow dog and Dorothy costumes and leave all your cares back in Kansas. “Despicable Me” has been an insanely popular movie franchise among adults and kids alike. And if you’re like most movie-going folk, you just cannot get enough of those goofy little Minions. They’re adorable, weird and just plain silly. 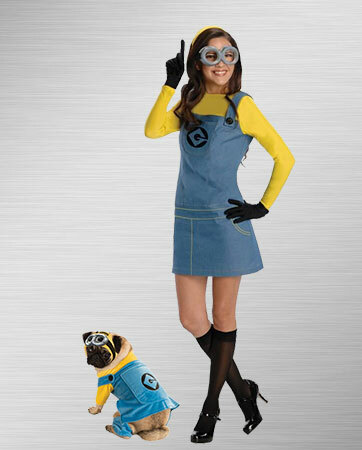 Now you AND your own little furry minion can celebrate these crazy yellow characters by pairing the Despicable Me dog and Lady Minion costumes. Run around town like your favorite creatures and have some laughs along the way. Tackle the mean streets of your neighborhood and throw down on some pizza with your favorite Turtle-in-Crime. 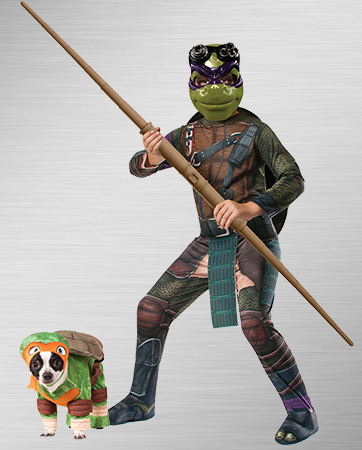 The Michelangelo and Donatello Dog costume pairing is the perfect combo for anyone in the mood to take on Shredder and his blasted Foot Clan. Whip out the nunchucks and practice your ninjutsu for a heck of a fun costume party. Find out who can deliver some dog-friendly pizza and you’re in business. Though villains may roam the earth, they don’t stand a chance as long as these two are around. 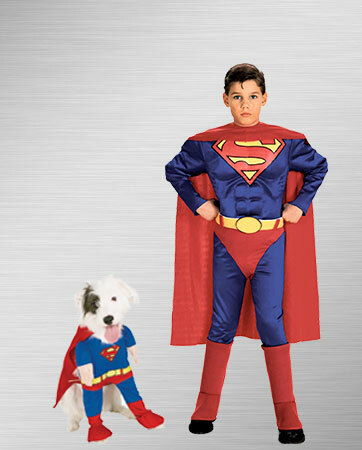 The Superman Dog and Boy costumes make a perfect match for the parents or children who are super fans of the Man of Steel and make our planet just a little cuter and a little safer. Match yourself with any other characters from the Marvel Universe for a killer costume party entrance. There are SOME folks out there who think dogs get too much credit. They think dogs are spoiled and get all the attention for no good reason other than they’re “more fun.” To those people we say, “Have you even looked at this pug dressed up as a taco?” Chances are, they haven’t. The Taco Pet Dog costume is the perfect closing argument for any “Are dogs better than cats?” debate. In the pet world, dogs get all the glory. And in the pet costume industry, things are no different. It’s always the dogs in clever “Hot Dog” costumes or Santa jumpsuits that attract all the “awes” while the cats get zilch. It’s no wonder people think cats aren’t as fun. Well not anymore. This simple and adorable Princess Leia Hood is great for your favorite feline friend and proves once and for all that cats rule and dogs drool.